Cedar Waxwings Visit the Parking Lot! It was one of those 'stop dead in my tracks' moments. 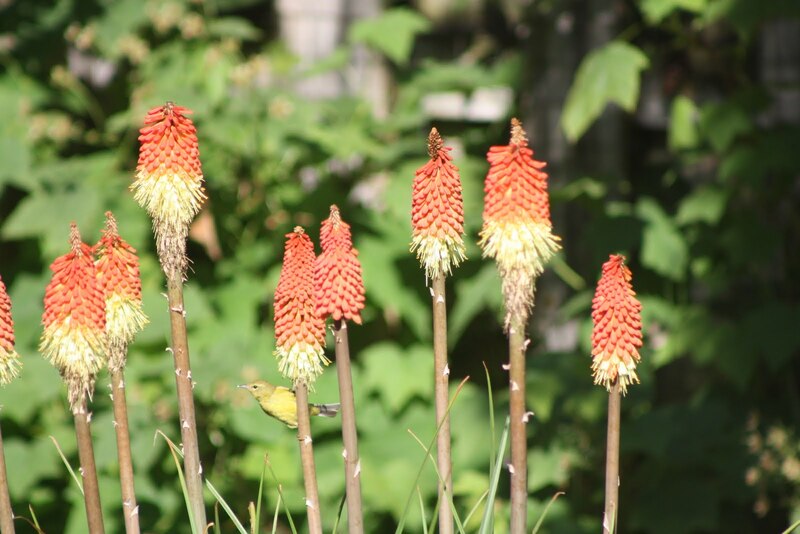 Two cedar waxwings were exploring the red hot pokers - those striking tall plants with the red and yellow tops in the 'garden' section of the village parking lot. I stood, stock still, and watched. I'd never before seen a cedar waxwing up close. ﻿﻿﻿﻿﻿﻿The photo below is not mine, of course, since I'd been grocery shopping and left my camera in the trunk of the car. Drat. Cedar waxwing. Photo by David Menke. Courtesy US Fish & Wildlife Service. The first thing I noticed about the two waxwings in the village was the sheen of their smooth-looking coat. Almost unfeather-like. Then that black mask and feathered protrubance (I'm sure there's a scientific name for this) on the back of the head! After about ten seconds of allowing me to gawk, they flew off, and I heard their soft, lilting call as they headed over the village rooftops. 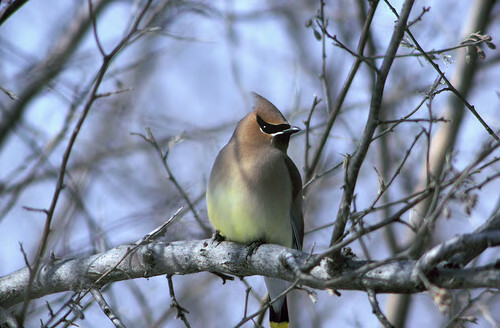 According to my ID guides, cedar waxwings (bombycilla cedrorum) come to BC to breed in the summer. They often gather in flocks in late summer and fall to gorge on berries. Apparently, they have been known to get 'drunk' on fermented berries. That'd be a sight worth seeing! In other Folklife Village bird news, I've been listening to the violet-green swallow nestlings chirping away under the eave just outside the bookshop whenever the mother or father arrives with food, which is often. It's delightfully distracting. The nest is well hidden from view but one of these days, soon, the nestlings will be big enough to start perching at the edge where they'll be visible, and their parents will be able to feed them (regurgitated flying insects, yummm) without going inside. It will be kind of a fast food drive through situation. This is a photo I took last year of the same nest site. Note the white decor everywhere. For more information than you'll ever need on this stuff, check out 10000birds.com, a New York blog that, for the past week, has been celebrating (is that the right word?) "Bird Poop Week". Really. Much of it is pretty interesting, and a lot of it is hilarious! I am not a shopper (unless you count GIRO) - and few things have the capacity to make a trip to a Nanaimo mall memorable. A feisty red-headed house finch singing his heart out while perched on the ledge of a department store window, though, did it yesterday. I heard him as we were walking from the car to the mall entrance. That amazing song always gets my attention – how could it not? If you aren’t familiar with it you can go to the Cornell Lab of Ornithology’s All About Birds site (www.birds.cornell.edu), choose ‘house finch’, then ‘sound’, and be prepared to be delighted. You can even ‘watch’ the song in sonograph form. Since male birds sing to attract a mate or protect a territory, I wondered why this eminently eligible finch had chosen as his home a vast concrete parking lot with only a few bushes and a couple of trees nearby. He was certainly no wallflower! But maybe that was the point; maybe he already had everything he needed, since female finches look for mates with the reddest heads and breasts and the most complex songs they can find. Apparently, these equate with the capacity to be a successful breeding partner. So maybe this guy was counting on his innate good looks and singing voice - the Elvis of the bird world? And home is, after all, wherever the heart is. It's the second day of summer and the yard is full of juveniles and quite a few visitors. 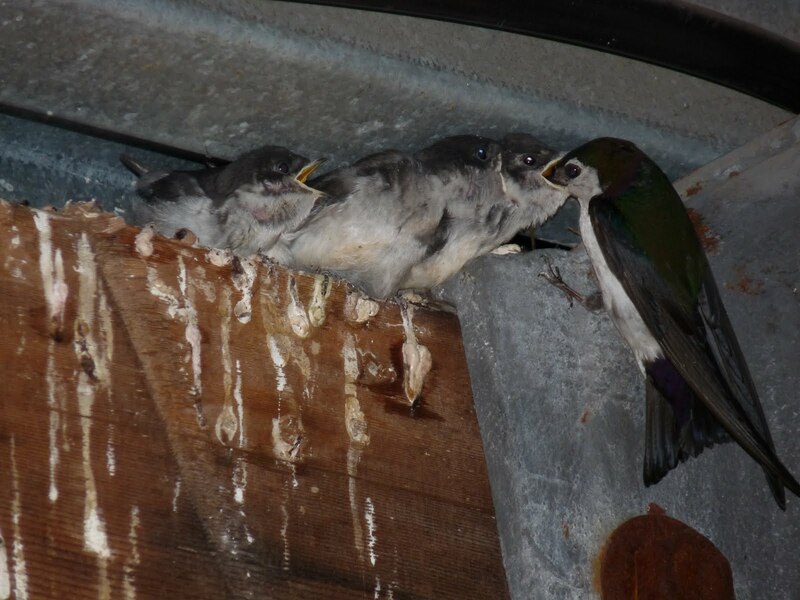 It appears that, as of this morning, all the violet-green swallow fledglings have left the nest box under our garden shed in the back yard. I don't know this for sure, of course, since this is not the nest with the nest cam in it. (Wouldn't you know?) That nest, in our front yard, was abandoned early on, half built. It had nests in it for the last two years but this year the parents built half a nest and left. I'm guessing it had to do with all the European starlings that were hanging around at that point, taking advantage of the suet. With their innate good sense, the swallows probably didn't want to risk nest predation. I mean, really, if you had a choice, would you painstaingly build a lovely wooden home next to a known arsonist? No disrespect to starlings intended - I know they're just being starlings. And I was actually pleased that they nested nearby and I got to watch the mother feed the babies our suet. Last evening and this morning a MacGillvary's warbler was snacking on the red hot poker in the front yard. This is the first of this species I've seen in our yard. 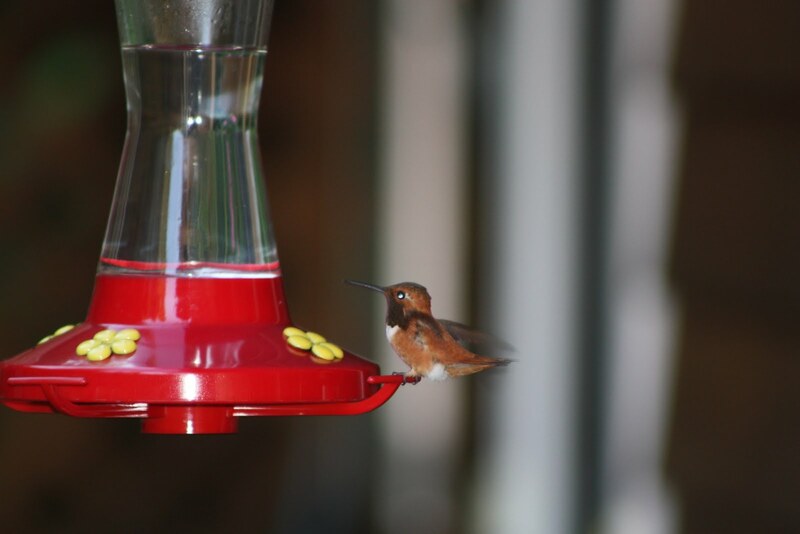 I didn't realize this rufous hummer was so young until I saw the photo! ... but most of these guys were migrating from Central America, just passing through Gabriola, which is (delightfully) on the Pacific Flyway. So no, don't fret. Don't up the sugar content. Don't take it personally - it's as it's meant to be. As usual. 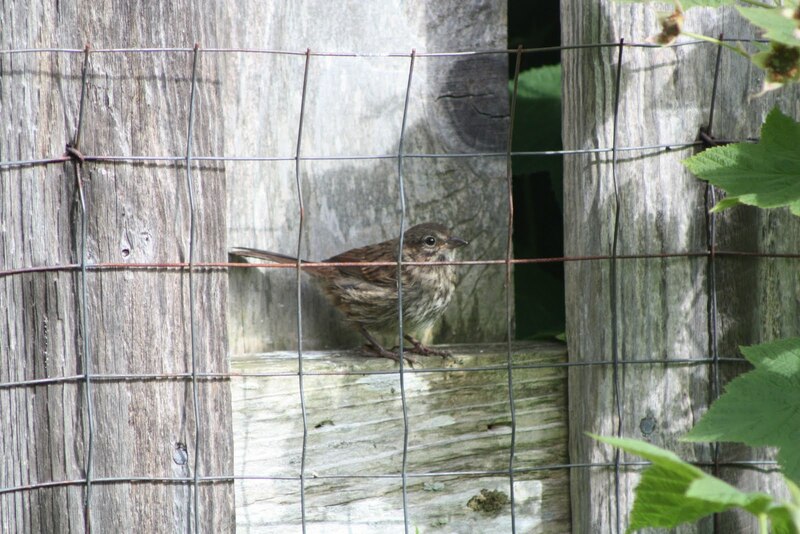 Here's a juvenile sparrow (song, I think) in the yard this morning. I wonder if it liked the "security" of the wire fencing? 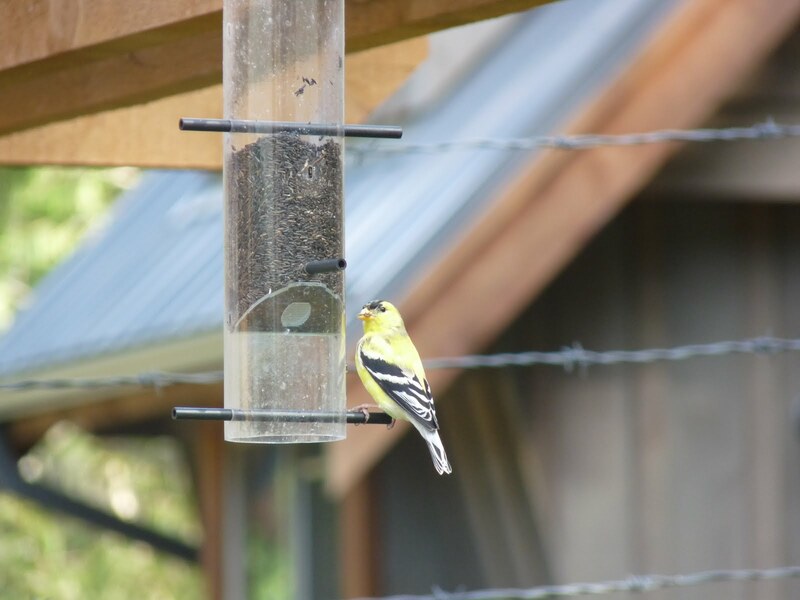 Remember, if you're hoping a pair of American goldfinches will nest nearby, be sure to leave some thistle in your garden because they use the down to line their nests. Since thistle doesn't bloom until late July or early August - and it's quite beautiful when it does - that's when the American golfinches begin breeding. I'd love to know ... what are you seeing in your Gabriola yard and garden these days? Hi. I'm Sharon from Gabriola Island, a gulf island off the coast of B.C. I’ve been living here since 2007 and writing a monthly bird column called Just for the Birds in one of our local newspapers, The Flying Shingle, for several years. I am not an ornithologist or a scientist of any kind. I'm just a person who became fascinated with wild birds after moving from the city to this lovely island. 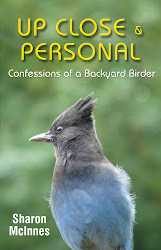 My limited knowledge comes from observation, reading, and talking with other people interested in the birds in their backyards. Writing the Just for the Birds column allows me to combine two of my greatest passions: birds and writing. I appreciate, and usually learn from, the feedback I get from readers. But I’ve realized a monthly column isn’t quite enough any more. 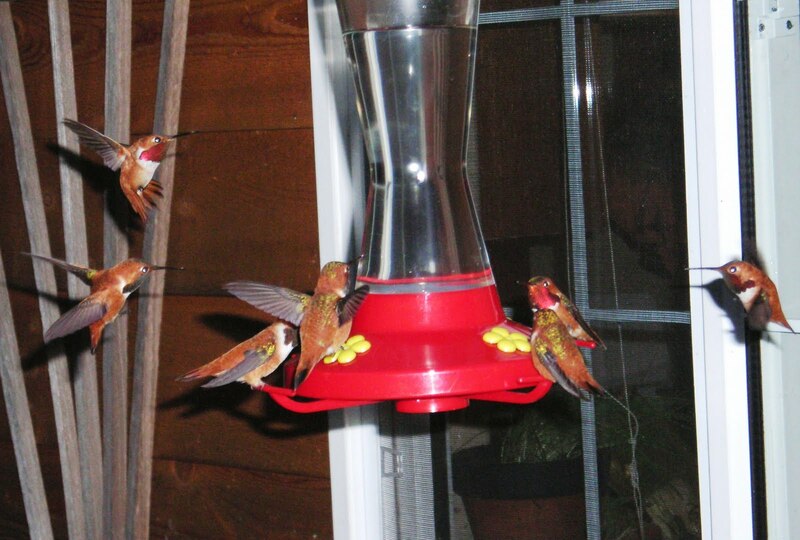 So much happens in between columns in the bird world, even in my own back yard! Thus, this blog. I hope you’ll enjoy and contribute.